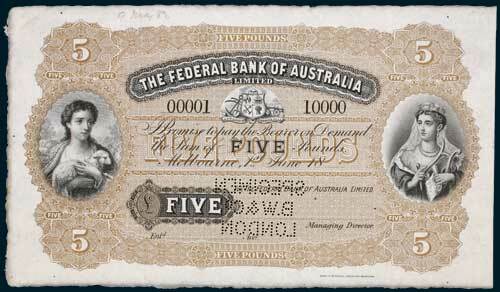 THE FEDERAL BANK OF AUSTRALIA LIMITED, specimen five pounds, Melbourne, 1st June, 18-, discordant serials, No. 00001 and No. 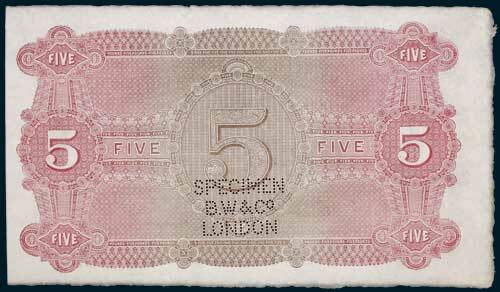 10000, imprint of Sands & McDougall, Engravers, Melbourne, SPECIMEN/BW & Co/LONDON perforated in three lines at signature reserve, '9 May 82' pencilled in top margin (MVR 1s). Nearly uncirculated and rare. Ex Spink Australia Sale 17 (lot 1193, part).